"Alpha" indicates that this version of Thunderbird is a pre-beta release: it may still be unstable, and it is not recommended in a production environment. Thunderbird 2 Alpha will use your Thunderbird 1.5 profile. Consider backing up your profile first. Among numerous bug fixes and stability improvements, the alpha release of Thunderbird 2 introduces several excellent features, some of which are outlined below. A more complete listing of Thunderbird 2's new features and bug fixes is available at the Rumbling Edge, or at the Mozilla site itself. As an alpha release, this is not the final version of Thunderbird 2, and features may be removed or added by the time Thunderbird 2 is released. The new email ticker that appears with new emails on the bottom right of your screen has received an overhaul with Thunderbird 2: it is now much larger, and includes a summary of new emails' subject line and senders' names. Already part of Firefox (the standalone web browser created by the Mozilla Foundation), incremental search is introduced in emails with Thunderbird 2: while focusing in an email's body, start typing the word/expression you are looking for, and Thunderbird does the rest. The search bars shows up at the bottom of you email, and can be closed with the [ESC] key. The screenshot above does not do justice to Thunderbird 2's incremental search: the first set of matching characters is selected live - as you type. While ways to manage themes (skins for Thunderbird) and extensions (mini-applications extending Thunderbird's core functionality) in Thunderbird 1.5 is not bad, Thunderbird 2 consolidates their installation and updates under a single Add-ons Manager. In the screenshot above, your see Thunderbird 2's Add-On Manager with the Themes tab selected. As with Thunderbird 1.5, themes can be updated or uninstalled; the Extensions tab works much the same way: unlike themes, however, extensions can be "disabled", and Thunderbird will act as though they had never been installed. Thunderbird 2 introduces folder hints, which give you a preview of unread emails when you move your mouse cursor over it (up to three, it seems). 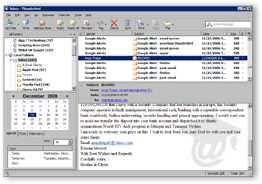 Thunderbird 2 allows you to switch between three folder "views": All (default), Unread Folders (containing unread emails), Favorites (see below), and Recent (email folders or feeds visited recently). Simply click the horizontal arrows to change the view, or go to View > Folders > All/Unread/Favorites/Recent. Thunderbird 2 introduces (in Thunderbird) the concept of Favorite Folders. Any folder whose content you consult regularly is an ideal candidate for being "favorited". By default, only the Inbox is a Favorite folder. To add a folder to your Favorite Folders, right-click it and click Favorite Folder: a checkbox will show next Favorite Folder in the folder's context (right-click) menu. To remove a folder from your Favorite Folders, follow the same procedure to uncheck the Favorite Folder menu item. In our Using Folders and Labels tutorial, we were deploring the absence of configurable labels. It seems like many other Thunderbird users felt the same way, since Thunderbird 2 now introduces "Tags" to replace Labels. Unlike Labels, Thunderbird's email Tags can be configured. They can be deleted, created, assigned names as well as one of 70 colors using Mozilla's standard color picker; presumably, email Tags will be editable by the time Thunderbird 2 is rolled out. 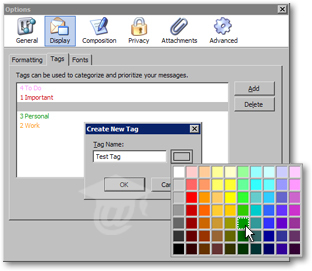 To configure email Tags, go to Tools > Options, and click the Tags tab under Display options. Since the five default Tags are the same as the five default Labels in Thunderbird 1.5, you will not lose your labeling scheme by upgrading to the official (not alpha or beta) Thunderbird 2 release. This was a partial and brief overview of the features to come with Thunderbird 2. Once the final release of Thunderbird is out, we will update our tutorial and cover all new features in depth.